4 Bedroom Semi Detached House For Sale in Chislehurst for Offers in excess of £550,000. 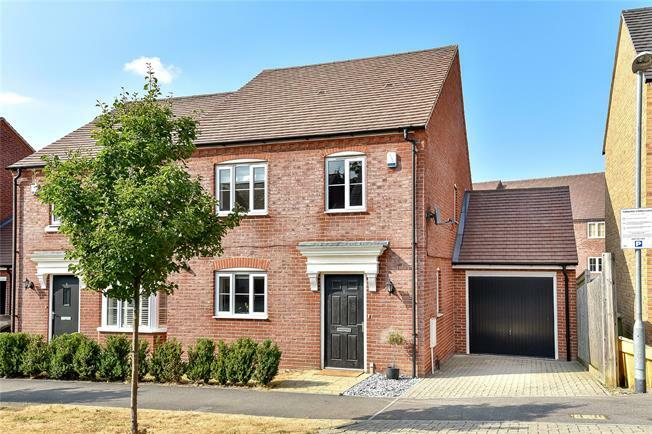 Located on the very sought after Kings Quarter development, is this rarely available four bedroom semi-detached house. Built to a high specification, constructed approximately five years ago and still benefitting from a NHBC warranty, the property offers a spacious entrance hall, modern fitted kitchen with granite worktops and integrated appliances, downstairs WC and a large 17'3" lounge/diner overlooking the larger than average rear garden. The first floor offers four bedrooms with the master bedroom offering en suite facilities and there is also a family bathroom. Outside enjoys a well maintained rear garden and a driveway to the front which leads to the attached garage. The outstanding Bullers Wood Secondary School is approximately 0.8 miles away with the boys school also due to open this year. Chislehurst Village with the ponds and High Street is also a walkable distance and Elmstead Woods station is situated approximately 0.5 miles away.